news from the world of Boccia | BocciaNews.com compiled & presented by DEMAND – a not-for-profit charity. With your help we transform the lives of people with disabilities. 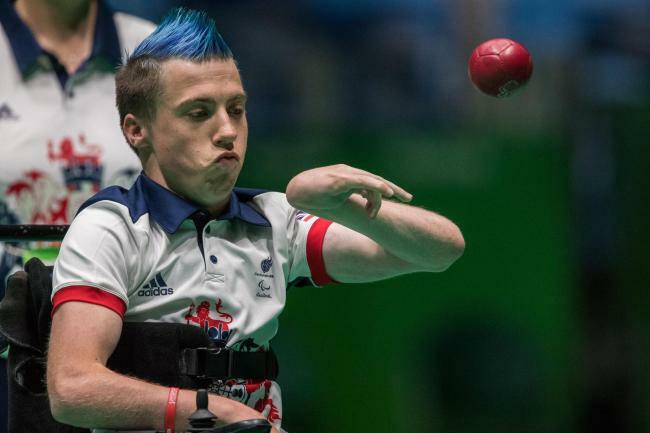 Britain’s Paralympic champion boccia star David Smith is expecting to face greater competition from Asian rivals as the standard of the sport rises in the build-up to Tokyo 2020. Smith, a four-time medallist who claimed team gold at Beijing 2008 before individual silver and team bronze on home turf at London 2012, shocked world champion and number one ranked Pattaya Tadtong of Thailand at the quarter-final stage in Rio. He then defeated Dutch opponent Daniel Perez in the final. But the 27-year-old realised that greater success brings greater expectations. “Medals mean funding, that’s quite a lot of pressure,” he said in an interview published on the International Paralympic Committee website. “The main thing she tells me is to focus on myself, not worry about anything else, try not to let the pressure, and the fact that I’m normally a breadwinner, not let that get to me. South Korea and Thailand have led huge improvement in the sport from across Asia in recent years. “They’ve taken it on another level, across all the categories,” Smith added. After a “well-earned rest” since his Brazilian exploits in September, the Briton is now in training for the 2017 season. His biggest challenge is expected to be the Boccia International Sports Federation European Championships in Povoa, Portugal. Boccia International Sports Federation (BISFed) President David Hadfield has claimed that 2016 was the “most successful year yet” in the history of the sport. Hadfield made the assertion during his New Year’s message to BISFed members, where he looked back on the governing body’s achievements over the past 12 months. He said that boccia is the “fastest growing” Paralympic sport, while reflecting that the Rio 2016 Paralympic Games “produced the most competitive boccia event yet, with an ever higher level of skill on display to record spectator numbers”. The governing body’s “Making Boccia Accessible” scheme, which is supported by the International Paralympic Committee’s development arm the Agitos Foundation, UK Sport, GB Boccia and law firm Hogan Lovells, was also reflected upon. It is claimed the programme, which aims to train “ambassadors” in the sport across the world, has helped to introduce boccia to 23 countries which did not have an active presence. A total of 10,000 people are believed to have participated in the sport as a result of the scheme, with Hadfield stating that BISFed are seeking additional funding to deliver the next stage of the project. Bahrain, Costa Rica and India were all welcomed to the fold during 2016, taking the number of total member countries to 57. The number of world ranking events was quadrupled during the 2013 to 2016 quadrennial, while BISFed developed a software system to help support operations and manage competitions effectively. The competition management system will be used for the first time this year, with the governing body describing it as “world class”. Updated rules and new tests for boccia balls are set to be completed before this year’s competition schedule begins, while a coaching pathway is expected to be published later in 2017. Hadfield also encouraged members to consider candidates for elections to the BISFed Board, with several existing members required to step down when their terms come to an end at the governing body’s General Assembly. The Assembly will take place in Hong Kong on May 27, following the conclusion of the Asia and Oceania Regional Championships. Eastleigh-born Rio Paralympic gold medallist David Smith has been awarded an MBE for services to Boccia in the Queen’s New Year’s Honours list. The BISFed Competition Committee presented their proposal for the 2017-2020 Competition System at the BISFed Extraordinary General Meeting (EGM) in March 2016, and the new Competition System was approved and published in July 2016 . In the feedback session at the EGM, it was agreed that a reliable World Ranking system was a key component of an effective competition system. The Committee explained that developing a World Ranking system which would support the new Competition System would be our next priority. The Competition Committee is now working on a project to update and revise the world ranking system. Most of this work has focused on the key principles that should be underpin an effective ranking system (for example awarding equal points for 1st place at the same type of event held in different regions) and aligning those principles to the proposed events for the 2017-2020 cycle. With support from UK Sport, BISFed is currently working with a team of mathematical and statistical experts who have expertise in developing ranking systems. Our aim is to develop a new World Ranking system which will be used in BISFed competitions. The BISFed Board is monitoring the project closely and will provide an update before 31st December 2016. The BISFed Competition Committee would like to announce the provisional calendar of events for 2017. These events are confirmed subject to contracts so some information may change. The rules committee has been working long and hard sifting through the proposals and responses from our members. We specifically considered FAIRNESS and EQUALITY when making these decisions. After many hours and much debating we have our first draft of the 12th edition ready to present to you. These rule changes were proposed and accepted from survey results. In page 3 of the Rule book you will notice that we ask for your observances throughout 2017. The rules are set for 2017. We are accepting comments regarding structure, wording and grammar until Dec 9, 2016. After which, we will have them checked by a law firm. We plan to publish the final version in early January. We listened to the athletes. We agree, ramp restrictions make pointer length and seat height restrictions unnecessary. We have added more clarity by having better definitions and arranging the rules in chronological order. Again, we heard what the athletes are asking. More freedom for BC3 in the throwing boxes – many of the athletes asked for this to equalize sighting capabilities and to be on par with the other divisions that already have freedom in the throwing boxes. Penalty balls – athletes expressed concern that often throwing a penalty ball put them at risk of losing points they just earned, because all the balls are so close together around the Jack, especially when playing at the International level. A clear shot to earn the penalty point would be more fair. We have a unique and elegant sport. Spectators understand penalties where the playing field is cleared and the athlete gets a free shot at the target. This benefits the athletes, makes things clearer to the spectators and as a bonus helps the referee. There are some athletes who have already been working on this shot. Reports that have come in, show that success has increased dramatically in just 2 weeks of practicing this shot. We listened to the coaches. They asked for more opportunities to coach the Team and Pairs athletes. Now they are permitted to come and speak to them between every end. With all of us working together Boccia becomes better and better. 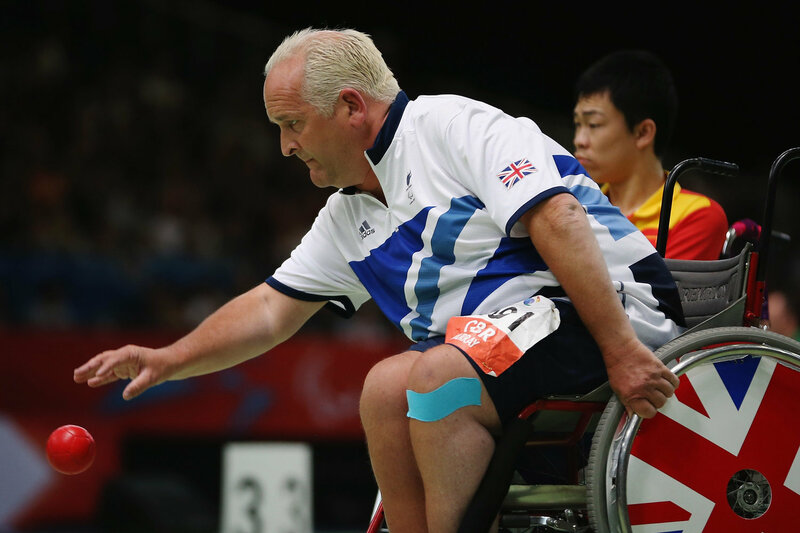 In the 2013 New Year’s Honours, Nigel was awarded a MBE for services to boccia. This recognised not only his performances but his role as an ambassador for the sport both across the UK and in his local community. He has been supported throughout his journey by his partner Sylvia Taylor who has been a rock for him every step of the way. 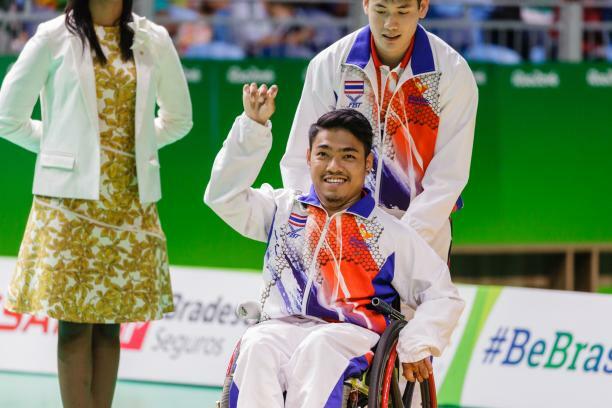 After failing to reach the podium at the London 2012 Paralympics, Hong Kong’s Yuk Wing Leung avenged himself by winning the mixed individual BC4 title. He won the 2014 World Championship and surged to the No. 1 ranked spot. However, he did not reach the 2016 World finals, showing the stiff competition in the category. But at Rio 2016, Leung faced many close matches to pull through to the finals. He faced Slovakia’s Samuel Andrejcik in an exciting gold medal match, where Leung triumphed 4-3. Leung scored twice in the final end to secure his first medal since Beijing 2008 and individual gold since Athens 2004. Thailand claimed five medals (two golds), winning every medal event they competed in including the individual BC2 match which was an all-Thai showdown. Compatriots Worawut Saengampa and Watcharaphon Vongsa dueled for the gold, and it was Saengampa who defeated the defending world champion 5-4. The pair joined forces in the mixed team BC1-2 gold medal match and beat Japan for the title. Pornchok Larpyen surrendered only one point to South Korea’s Hyeonseok Seo to capture the individual BC4 bronze medal match. Larpyen was also key in the mixed pair BC4 bronze medal comeback success over Great Britain. Four years ago at London 2012, Thailand took home two gold medals. Brazil’s Eliseu Dos Santos and Jose Dirceu Pinto have dominated the pairs BC4 category since teaming up in 2007. They took gold at both London 2012 and Beijing 2008, and were the heavy favourites to complete a hat-trick at their home Games. However, the Slovakian team of Andrejcik, Robert Durkovic and Michaela Balcova, entering No. 5 ranked in the world, upset the Brazilian crowd. The reigning European champions, scored in each of the last two ends, whereas Brazil failed to secure points. This could spell the beginning for Slovakia and the end of the Brazilian’s reign. South Korean athletes competed in six medal events claiming two medals highlighting the continuing development of the sport in the country. Their biggest victory and lone gold came from Ho Won Jeong in the individual BC3, where he dominated Greece’s Grigorious Polychronidis 8-1. It was Jeong’s first individual gold after three Paralympic Games appearances. South Korea’s other medal came from Games debutant Won Jong Yoo, who took bronze in the BC1. After taking silver at his home Games, Great Britain’s David Smith bounced back to reclaim gold in the individual BC1. He had pretty much dominated every opponent he faced, with the exception of Thailand’s No. 1 ranked Pattaya Tadtong – the very player whom Smith lost the gold to at London 2012. At Rio 2016, the two met in the quarter finals that went into a tiebreak. After getting past Tadtong, Smith cruised in his finals with a 5-0 victory over the Netherlands’ Daniel Perez. 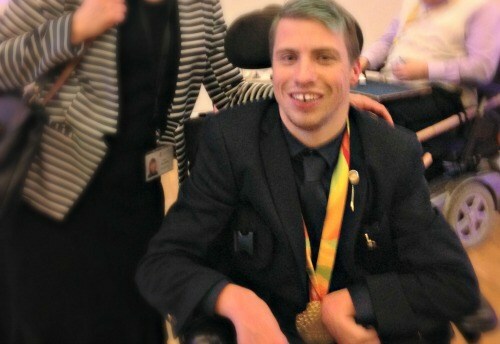 DAVID Smith his hoping to boost Boccia’s profile after winning an individual gold medal at the Paralympics. The 27 year-old won the 51st of GB’s 64 gold medals – while sporting a blue mohawk. He received a letter of congratulation from the Mayor of Eastleigh after scooping individual gold in the Boccia BC1 class. 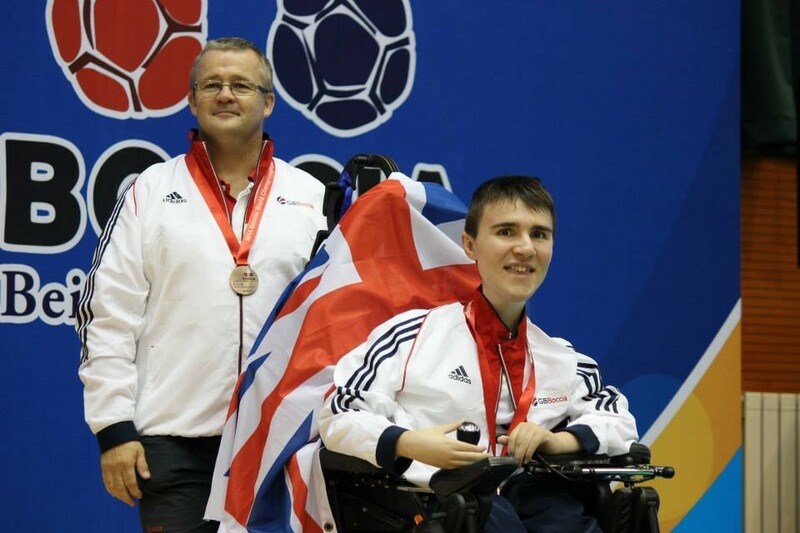 David, who was born, raised and educated in Eastleigh and is now at University in Swansea, built on his team gold in Beijing and silver in London with GB’s first Boccia medal in Rio. After dominating the final, winning 5-0 against Holland’s Daniel Perez, he said: “I had lots of chances and didn’t take as many as I would have wanted. “It could have been a hatful but it wasn’t. Smith’s gold was one of 11 won by GB on the Rio Paralympics’ penultimate day. He has since discussed his desire to boost Boccia’s profile with Sports Secretary Tracey Crouch. “Hope she can help me push Boccia!,” he tweeted. Mayor of Eastleigh, Cllr Des Scott, has written a letter of congratulation to David, who is already a Freeman of the Borough, for his sporting achievement. The Mayor said: “We were all cheering David and the team on in Rio. SINGAPORE – A handful of fans were at Changi Airport to welcome Boccia players Nurulasyiqah Mohammad Taha and Toh Sze Ning back home from the Rio Paralympic Games on Tuesday (Sept 20) afternoon. The duo might have returned home empty-handed from Rio, but the crowd support they had received in Brazil left the biggest impression on them. Their eyes lit up with excitement when they recalled how they were cheered on by boisterous crowds who did Mexican waves at the Carioca Arena, the Boccia competition venue. The pair were greeted at the arrival hall by their family members and sports officials, including Singapore National Olympic Council president Tan Chuan-Jin. Nurul and Toh earned the Republic’s best result in the sport at the Paralympics when they made it to the BC3 mixed-pairs bronze medal playoffs, following upsets over higher-ranked opponents Portugal and Greece. But they eventually lost 1-8 to Greece to narrowly miss out on winning Singapore’s first Paralympic medal in the sport. Nurul, 31, said: “We are sad, of course, but we have surpassed people’s expectations. We also felt surprised and a bit overwhelmed when we beat the higher-ranked teams, which sent a message to other teams that we can win if we put in 100 per cent of our efforts. It appears that missing out on a medal has made them even hungrier to go one step further at the Games’ next edition. Even though Nurul will return back to her job as an auditor after taking a two-year, no-pay leave to prepare for Rio, she is already eyeing a medal at the Tokyo 2020 Paralympics. She joked: “So this means that I cannot retire yet right? The work is not finished yet. I will be back for Tokyo. For me, I’ve always planned in blocks of four years before the next cycle continues. We need to plan now for the next four years.